Digital Transformation: Who's in Charge? Digital transformation projects need speedy implementation, which often means bypassing IT. It's hard to avoid digital transformation today. Many organizations are embarking on projects in order to gain competitive advantages and boost bottom lines. While digital transformation initiatives are largely driven by the business side, it does bring into question what role IT should play. Should IT implement digital technologies, influence digital transformation decisions, or step aside? With cloud services on the rise in many enterprises, it's not hard to envision scenarios in which IT gets bypassed while cloud services deliver digital transformation directly to business units. A CIO article sponsored by Dell EMC Services provides a couple of good definitions for digital transformation. A short definition is, "Digital Transformation is application of digital capabilities to processes, products, and assets to improve efficiency, enhance customer value, manage risk, and uncover new monetization opportunities." "The coupling of granular, real-time data (e.g., smartphones, connected devices, smart appliances, wearables, mobile commerce, video surveillance) with modern technologies (e.g., cloud native apps, big data architectures, hyper-converged technologies, artificial intelligence, blockchain) to enhance products, processes, and business-decision making with customer, product and operational insights." The first definition is a bit higher level, emphasizing the business goals previously mentioned, while the second makes it a bit easier to wrap our heads around which specific technologies play a role. Both definitions mean business disruption will occur if you want to be competitive. New Technologies: Who Knows It? When mobile communications first emerged, it was very disruptive. Organizations had to modify their businesses to deal with the realities of mobile users and customers. Before mobility, we had the Internet with all the online capabilities. Both mobility and the Internet took years to absorb. Now we have artificial intelligence, machine learning, big data, analytics, and the Internet of Things (IoT). The question is, "Can IT control and deliver these new technologies rapidly?" IT staff needs to be trained and educated. Some of the training and education could just as easily be provided to the business unit, and not IT staff. The continued budget pressure for IT maintaining its operations leaves less and less funding for innovation. One of the most common complaints about IT is that it is too slow to deliver the services needed by the business units. There are reasons for this, such as ensuring the security and compliance with regulations and legislation. When a competitor decides to digitally transform their business, then the business unit has to respond ASAP. Cloud services are offering non-traditional solutions to business problems. Some cloud services perform analysis of the use of their products and services. These providers can change their solutions quickly to ensure they keep the loyalty of their present customers and obtain new ones. The issue for the business unit is selecting the proper and reliable cloud service that satisfies its needs. Unfortunately the problem is that one cloud service does not meet all these requirements. This is one of the points explored in my previous blog, "How Do You Connect to the Cloud?" A good article on the question of digital transformation responsibility is, "Who takes responsibility for digital transformation?, " published in Computing, a U.K.-based publication. One significant hurdle to overcome is the fact that many IT staff members find it difficult to communicate technical issues to business unit leaders. If IT is overly simplistic in their explanations, the business unit thinks it is a relatively risk-free solution. IT has to stop hiding behind acronyms and technical jargon. IT needs to explain digital transformation in a language the business unit can understand. Another Computing article, "How IT can do more to educate the business about digital transformation," asked who should be the lead in digital transformation. The chart below demonstrates some interesting conclusions. The largest majority of respondents in the survey (52%) thought that digital transformation should be a 50-50 split between the business unit and IT. 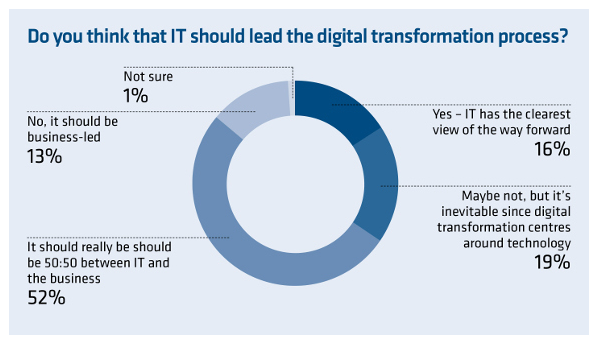 Only 16% thought that IT has a clear view of how to implement digital transformation. In contrast, 13% thought it should be led by the business. When the business unit wants to take the lead for digital transformation, it may be a good idea for IT to place one of their staff within the business unit to create a liaison between the groups. Business units may think they know everything they need to know about digital transformation but there are experiences that IT has that are germane to a project. It is also important that IT become immersed in the business unit so they can understand what factors are driving digital transformation, how rapidly it needs to change, and what the competition is doing. IT can create business unit services with a combination of on-premises and cloud technologies. If IT wants to continue its role, IT needs to be proactive and rapidly react to changes in the business units. It is up to IT to learn about the competition and provide tools and technologies that can help the business unit compete more effectively. Digital transformation needs speedy implementation, thereby bypassing IT. IT has to learn to move quickly to implement the technologies. It is also important that business units understand that some of digital transformation projects may fail. That does not mean a failure in the normal sense. It means that they need to go back and look at what they wanted to do compared to what the competition is doing to ensure that the next project is successful.